Question Loading Issues Resolved: We've investigated and resolved loading issues associated to questions with opt-outs. 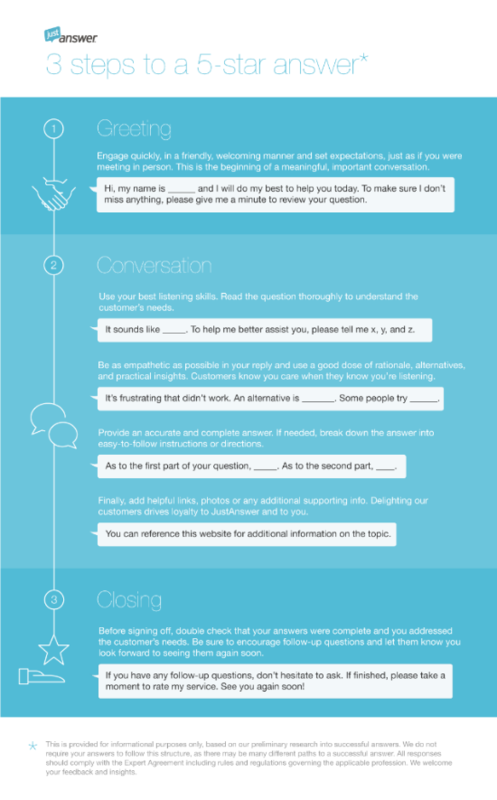 Inspired by the great feedback we received from the original Anatomy of an Answer and Path to Answer, we are excited to share these 3 simple steps to 5-star answers. This chart includes suggested ideas and best practices from Experts who have demonstrated an ability to consistently deliver great customer experiences. Try these ideas out on your own and feel free to share your feedback with us. We would like to offer a sincere thank you to all of the brave men and women in the Expert community who served. We are grateful for your courage and humbled to have you a part of our community. Thank you.